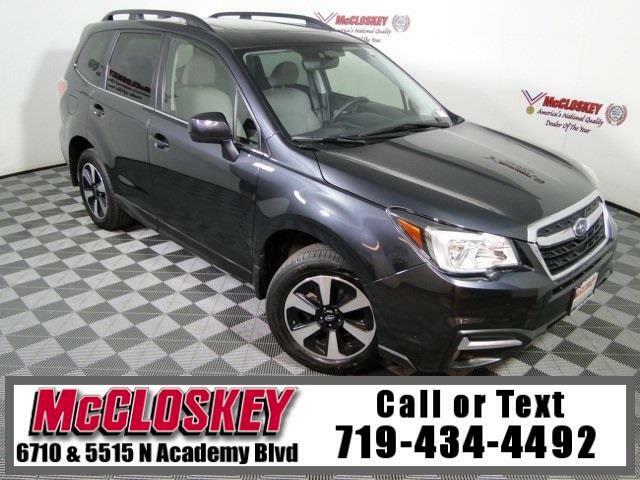 Well-equipped and capable 2018 Subaru Forester 2.5i Limited All Wheel Drive with Blind Spot Monitor, Power Moon Roof, Backup Camera, StarLink, Power Lift Gate, Heated Leather Seats, and Premium Sound System! The 2.5i Limited builds on the Black Edition features with a power liftgate, leather upholstery, an upgraded driver information display and a cargo area cover. Blind-spot monitoring, rear cross-traffic alert and 17-inch wheels are also standard. The motivator for this Subaru Forester is a 2.5L engine able to produce an impressive 170 horsepower and 174 pound-feet of torque! The Forester's comfortable cabin and quiet ride make the case for taking this SUV out of the city and onto the open road. This vehicle passed our 110 multi-point inspection and is backed by our National Quality Dealer of the Year Award. We are an ''A+'' Better Business Bureau Rated Business. We offer low interest rate financing, low down payments and the highest trade allowances in the state! Here at McCloskey we do things a bit differently, we shop our competition every day to ensure a great value to you. Come on down and experience it for yourself. This McCloskey Assured vehicle includes a 2 month/2000 mile Warranty and a Vehicle History Report!! At McCloskey we strive to provide ASSURANCE, TRUST, VALUE AND QUALITY! Call 719-434-4492. Message: Thought you might be interested in this 2018 Subaru Forester.